Badlands then receives a searing performance. The band seems to put everyting it has got into the song and it is an early but definite highlight. The enthusiastic audience then gets to sing the first verse during a jaunty version of Hungry Heart before Outlaw Pete takes its place as the centrepiece of the early part of the show. It is played, as usual, more urgently than on the album though I would not rate it as highly as the Rome peformance. Next up is Working On The Highway. The song begins with a fairly lengthy drum intro from Max Weinberg, followed by amplified electric guitar which gives it a lighter feel. There is also an organ solo and a sax solo at the end which takes the song to five minutes. Working On A Dream follows, featuring a bilingual and mercifully brief house building speech. Then we are treated to another tour premiere, a superb, tightly-sprung Murder Incorporated, complete with a fine sax solo from Clarence Clemons and superb solos from all three of the band’s guitarists. Johnny 99 is then played in what has become the usual version, with multiple solos, train whistle style backing vocals and a false ending followed by guitar and drum sourced locomotive noises. A surprise ensues in the shape of a second Italian outing for American Skin (41 Shots). Labianca surmises that this may be because “Bruce knew that racism and intolerance – in the Berlusconi era – is increasing under the Italian skies.” It is a fine performance though it fails to create the same frisson as the version from Rome. A lengthy and enjoyable Raise Your Hand heralds the sign collection. 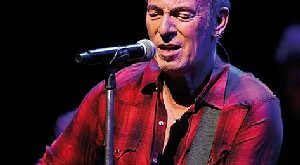 Once again, the song begins as an instrumental, before Springsteen returns to add his vocals. This is followed by a boisterous and hugely enjoyable Travelin’ Band, the first complete performance since 2004, and played a matter of days before John Fogerty’s own Italian shows. During Raise Your Hand three identical, sealed and numbered envelopes had been tossed on to the stage. Opening the first, a request for Drive All Night, Springsteen shook his head. However, his curiousity aroused, he opened the second envelope, only to find a further request for Drive All Night. He then opened the third envelope to find…Well, I guess you have got the idea! Drive All Night grew out of the marvellous spoken “Sad Eyes” interlude which graced performances of Backstreets during 1978, and, together with Wreck On the Highway, brings The River to its quiet and contemplative conclusion. The version here is beautifully restrained and affecting, with some gorgeous piano from Roy Bittan and two soulful sax solos from Clemons. It is perhaps the standout song of the whole show. 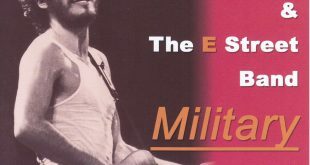 “The band rendition was one of the most intense I’ve ever heard in many years of listening to bootlegs,” writes Domenico Morello on Springsteen’s official website. “The real jewel of the night…magnificent,” opines the Point Blank writer. Two Hearts makes for a breezy start to the second disc and, as usual, ends with a brief snippet of It Takes Two. The fast-paced but rather inconsequential My Love Will Not Let You Down then receives its first performance since 2003. Waitin’ On A Sunny Day is as jolly as ever and is enhanced by a vocal contribution from a child who, unlike his counterpart in Rome, actually knows the words. The Promised Land, which follows, is similar to the Rome performance in that it seems to take a while to catch fire, though Clemons’ sax solo is inferior. Then we hear the gentle and dignified strains of My Hometown, another tour premiere and another highlight. The song avoids shallow nostalgia as the song’s protagonist reveals how the town in which he grew up has been scarred by racial clashes, indescriminate violence and economic hardship. The magisterial Backstreets provides a further surprise in the shape of the “Sad Eyes” interlude, albeit in a heavily truncated form. The surprise was not solely due to the fact that it is no longer performed. I had read Labianca’s account before listening to the CDs and he states that, “you hold your breath every night Springsteen performs ‘Backstreets,’ hoping he would remember that long soulful rap he used to perform in1978 in the middle of the song. And it won’t happen.” He goes on to imply that Drive All Night, which has its origins in that “rap,” is therefore the next best thing. The version do we get here runs thus: “Till the end/Till the end/Just you and me, baby/I wanna know where you are tonight/Are you Out There Somewhere?/Are you out there somewhere?/Are you out there somewhere?/Are you out there somewhere?” It may be insubstantial, but is is good to hear it. A spirited Lonesome Day then gives way to a characteristically fine rendition of The Rising, before an energetic but somewhat muddy-sounding Born To Run brings disc 2, and the main set, to a close. The encore begins with Land Of Hope And Dreams, enhanced by the backing vocals of Curtis King and Cindy Mizelle and some thunderous drumming from Weinberg. 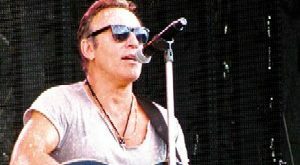 As has become customary, the latter part of the song, which is essentially Springsteen’s reworking of This Train, leads to a brief extract from People Get Ready. The rest of the encore recreates the ecstatic party atmosphere at the end of the Rome concert, though Glory Days replaces Bobby Jean. Glory Days ends with a brief instrumental snippet of Louie Louie and during Twist And Shout Springsteen leads the audience in an excerpt from La Bamba. Bizarrely, during the quieter interlude in Twist And Shout the organ can be heard playing a few bars of Brahms’ Wiegenlied (Cradle Song). The bonus tracks from Frankfurt derive from a Sirius Satellite Radio broadcast. Outlaw Pete is given an intense and atmospheric reading and Seeds, as always, is relentlessly driven. Ramrod is lyrically empty and musically simplistic, though it can work well live if performed with sufficient vitality. Unfortunately, the version here is staid and rather pedestrian. Point Blank, although suffering from the change of focus and lyrical content imposed upon it just before its recording for The River, receives an excellent performance. Lonesome Day is again spirited and Hard Times (Come Again No More) gives the backing vocalists a chance to shine, before Dancing In The Dark concludes the selection. 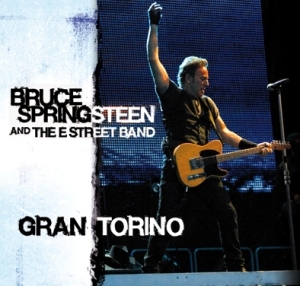 The sound quality of the Turin concert is very good, though not quite a match for Godfather’s Rome release (Late Night Special) which, despite some flaws, has a pleasing depth and presence. The first two songs, Loose Ends and Badlands, do not sound to well, but this seems to be due to problems with the sound in the stadium rather than Godfathers’ tape, and thereafter the sound is good enough for this to be an enjoyable listen. The noise from the audience, as in Rome, is effcectively contained. As befits an official broadcast, the sound for the bonus tracks is impressive, though the sound balance on Ramrod sounds odd to my ears. Outlaw Pete, Seeds, Point Blank and Hard Times (Come Again No More) benefit especially from the professional sound. Unfortunately, some of the songs are cross-faded, so that the end of one song merges into the beginning of the next, and this is particularly ugly as Ramrod gives way to Point Blank. The only DJ comments are at the end. Labianca need not have limited himself to one song, especially when commenting on a concert featuring six tour premieres. 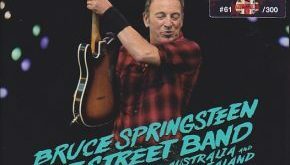 With Springsteen, failure to attend any single show may well mean missing out on something unusual, unique or special, and what applies to the concerts themselves applies equally to the CD issues of them. Although this may not be a front runner for those wanting only one or two shows, the presence of songs such as Loose Ends, Travelin’ Band, My Hometown, Murder Incorporated and Drive All Night will ensure that hardened Springsteen afficionados will not want to pass up this release.